I have still been sewing the odd Flying Geese...goose/singular....this week, but my spare time is getting less & less as we come closer & closer to Xmas! Lots of shopping for prezzies, lots of planning for "the big day", oh and a bit of trial sampling of my Pimms- making- skills!!!! I have been asked to provide said drink (is it a cocktail?) for lunch but I had never made it before. I googled of course, and am now subjecting visitors - Glenys was the first!!! - to rate my results! Turns out it's actually quite a pleasant & refreshing drink to help unwind after a hectic day, I highly recommend it!! A wee bit of a messy undertaking, but I'm sure the little ones will get the general idea!!! I have just ordered this, Luminaries pattern, it looks really lovely, don't you think? It does involve "precise measuring & trimming" , a wee challenge maybe but it's now definitely on my "to do" list for 2014!!!! We are off down to the bach on Xmas day for a few weeks, so I did think I'd better get a little bit of sewing organised to take along too, you know....just in case!!!!! Earlier this week I picked up my Zig Zag quilt that I left with Annette @ WildCotton to quilt. It looks great. I chose a nice pinwheel pattern which I feel softens all the straight line HST piecing. I have cut off strips of fabric for the binding & have sewed it onto the quilt....and now I'll have something nice & easy to hand sew down while sitting out on the deck. Also, just in case the weather turns really bad (which has been known to happen!! ), ﻿I have decided to be prepared!!!! 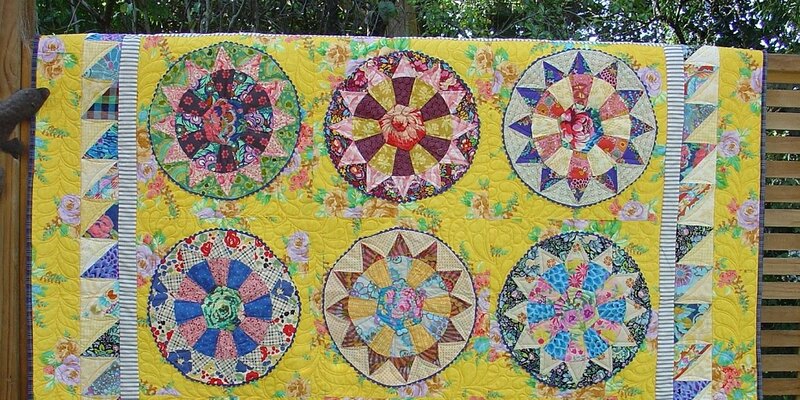 I really love the Penny Patch quilts that are springing up everywhere....small scale prints, simple geometrics & florals...all looking very vintage-y! I am following Rachel's receipe over @ http://www.stitchedincolor.com/ quite closely as I do like her colour combinations and I have fabrics in my stash that resemble the look. So I have cut a selection of fabrics all ready to go, just in case!!! 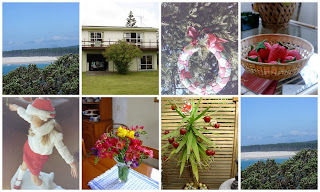 And I have hopefully discovered a helpful little item after reading Robyn's blog the other day, over @ http://robynppblog.blogspot.co.nz/ . If you remember, Glenys & I are in the middle of one of Material Obsession's BOM "40 Shades of Grey" and we need to make these ridiculously teeny tiny hexagons....real soonish! I would normally tack around each, but Robyn recommends a Sewline Fabric Glue Pen, so I am going to try this out! So a bit more hand sewing for those beachy summery evenings out on the deck. Here's the thing thou' - Every year I always pack a few things that always remain untouched the whole time we are down there!! & cook lovely lazy meals .... I can't wait!! I hope everyone has a lovely Christmas and safe holiday. I am again using an assortment of Anna Maria Horner fabrics, combined with a few matching solids. The free pattern is one also of AMH's, "Mother Goose" Quilt. It ends up with nice biggish Flying Geese units, each 5" x 10" (You can find the pattern on her website). I have a few more to make yet to get a decent sized quilt top, and a bit of reshuffling around to ensure no two same fabrics sit side by side, but am happy with it so far! The arrangement is basically up & down, with the geese in vertical columns alternating their direction with each column, and no rigid colour order. While only using one designer's range, this gem finally has what I love - a bit of a scrappy feel and a nice light/dark dancey-thingey going on! !......I'm off now to water the garden! For me personally, patchwork has been a real creative outlet! My mum wouldn't let me take art at high school...it had to be Geography/French/History.... happily we worked thru' all that! But right from my early years of sewing I have loved working with colour and design. Ask any quilter, selecting the fabrics is really the fun part of making a new quilt. However, unlike the "daily- dinner- decision", making fabric decisions can be a bit trickier.....there's the expense of course, then chosing from the vast selection available, not to mention combining colours and achieving contrast - which is challenging/exciting for all of us, and then putting in all the sewing hours only to be possibly dissappointed with the results. I have found that if I just love the fabrics and feel they work well together, then it's do -able! Too simple I hear you all say?!?!??!? I really want to make something that is pleasing to my eye ....and I do tend to only buy fabric I like! Are others the same? Often simply separating your colours into "warm" & "cool" groups is an effective way to create some excitment. Laying your blocks out on a flat surface (like a design wall, the floor or spare bed) really helps get a good overall view of your work, then auditioning & rejection are vital steps to get a good balance of colour & pattern. I want to use up my stash ....and this does prove tricky at times, combining the old with the newer. Over the years while still working I managed to collect a bit of fabric, and Glenys & I have often laughed & justified buying a particular fabric for "when we retire" !!! Scrap quilts I have found are a perfect way for using up every last bit of fabric to make quilts that I love making & using. And often many a "bad" purchase or ugly fabric can be hidden away undetected within a lovely scrap quilt! I certainly don't want to waste my fabrics, and the cost of fabric in NZ makes us all selective in our purchases, but here's the crunch ......sadly sometimes what you plan in your mind just doesn't work in reality. Experimenting with colour is, for me, one of the pleasures of quilting, but maths was never my favourite! I try to make a sample block/small section first. The other thing I feel - & this seems to be the case for others too - is that leaving something for a while, then coming back to it can often be quite liberating! I do keep all my "rejects" and have, over the years, been able to include them into other improvisational type projects or quilt backings. I really want to make quilts that others can enjoy .....and it's been my experience that people just love receiving a quilt, whether it's traditional/vintage/contemporary/modern. I have just scratched the surface here today, simply adding a few of my thoughts. There are of course lots of books availabe, and I find blogs - each offering a different perspective on quilting -are a great source of inspiration for me. Cutting, sewing,quilting, and yes - unpicking too! - it really is a wonderful hobby!! I love fabric!! I've been thinking lately that there seems to have been a bit of a rush on using Anna Maria Horner (AMH) fabrics! And these quilts look great! The fabrics are all really gorgeous...... colourful, interesting and vibrant, and I do especially love both the gold & the teal colourway of the "Social Climber" fabric. But I can't say I am loving my own personal efforts to date!! To use just all one range has proven v. difficult for me. When I first learnt patchwork many people followed each other v. closely in the use of colours within a traditional block. Frequently the exact same pattern could have 2 different names depending on how the lights & darks were arranged!! And hues/value/scale of prints were all part of our quilty vocab!!! Most importantly, the magic colourwheel held all the answers!!!! NOT! I guess that's why all the pre cuts work today, fat 1/4 bundles/jelly rolls/layer cakes, etc........lots of fabric variety for your money, and you know the fabrics will all co-ordinate beautifuly together. Whether you stick to using solely the one bundle or go on to choose other things to go with it, they really are a good starting point. Something we certainly didn't have years ago!! My favourite style of quilt is scrappy. Using a wide range of prints & colours in my quilts is, to me, the v. esscence of patchwork. But lately I am drawn to this kind of "one range" overall look!!! So I am trying again! I have only the bindings to hand sew down on a couple of quilts & that's a evening job while I watch Downton Abbey. So, after my last few efforts with colour experimentation (!!) & rather than start something new this close to Xmas, I thought I'd continue on with something that had a real pattern & a real plan!! ...the Marcelle Medallion quilt I began a little while ago. It's from the book Liberty Love by Alexia Marcelle Abegg. As per the instructions, I am using Liberty fabrics as much as possible. However, I really don't have any large Liberty pieces, but luckily from now on the borders all seem to have a real scrappy look about them. The quilt is certainly busy with lots of piecing in it, & has a real vintage-y feel about it. I'm sure if I mix in my precious liberties with a few other bright fabrics, grey accents and dotty white backgrounds it'll all work!!! I know from experience that some quilts really do stay in that "to do" pile for ages/years and it was great today to pull out the pieces I had already sorted. 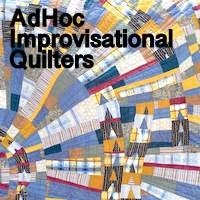 And, Alexia actually recommends that one thinks of this "as a quilt to bite off in small chunks, working on just one border at a time, watching the quilt grow" !!!! So today I got busy.......making 4 rows of 10 "tipsy triangles"....no, no that's not me, it's what Alexia actually calls them !!!! And I have to say her measurements are exact, from that initial center block to now, everything fits so nicely!! I'm really enjoying the hit & miss process of making these checkerboard squares. I haven't had much spare time to sew this past week, but whenever there's been a small window I grab it & make a couple more blocks. I am finding lately thou' that no matter whether I have a rough idea in my mind of what I want to make, or am totally random in my choices, things still have a habit of changing along the way!!!! Anyway .....I took all the "rejects" out, & they will be included in the backing now!! I then searched thru' my fabric baskets, and made more blocks that hopefully blend a bit better and still give my desired overall teal/tangerine look. I know that alot of my changes are due to the fact that I am also really, really trying to use up fabric that I have on hand. And, as some of my fabric pieces are now only small, I then have to substitute 3/4 of the way thru' a block.... but it's ok. One of the things I do love about quilts is those little surprises here & there!!! And so, after chopping & changing my mind about combining colours & chosing fabrics, I'm thinking I'll keep going with this now & make a few more blocks. Maybe just one more row?!?! ?